The Olive Tree and The Bible. The olive tree (Olea europaea) variety Oleaster is not the prettiest or most resistant in nature. It is a plant that belongs to the botanical family Oleaceae, and within this family it is the only one that bears an edible fruit. Its leaves have a dark green topside, while their whitish underside has a characteristic shine due to a thick cuticle. They have a simple lanceolate shape with smooth edges. It is an evergreen tree whose leaves live for two to three years. The fruit is the olive, a small ovoid drupe with a very bitter taste, with a yellowish green colour that turns purple as it ripens, until finally becoming black when it is fully ripe. In this moment, the pulp is oily with a stone that holds the seed. This tree has a thick twisted trunk and a wide branchy top. It grows mainly in the Mediterranean basin and in regions with a mild climate. The olive tree branches out at a very low height and its branches tend to disperse. It requires a great deal of sunshine and little humidity. The ground must be deep but dry. Its height varies according to areas and countries and ranges between 10 and 25 metres when fully grown, with a diameter of 8 to 10 metres. However, they are generally pruned every two to three years, maintaining a height of 4 to 8 metres. Production begins once the tree is into its eighth or ninth year, and gradually increases until it reaches the age of 35 to 40 years. Its productivity stabilizes at between 65 and 80 years of age, after which its productivity decreases. In the wood industry it is used to carve utensils and to make furniture of great strength as its wood is very hard. It is a tree that is both elegant and robust. With respect to its fruit, the olives used for oil production are harvested normally from the beginning of November till the end of March. However, those used for consumption are usually harvested at the end of summer and during the autumn. The olive tree is a millenary tree whose origin is still not clear. Olive tree leaf fossils have been found in Africa dating back to the higher Palaeolithic era (53,000 BC). In Spain , the oldest remains have been found in Garcel ( Almeria ), which date back to the Neolithic era (5,000 BC). Today it is believed that the current olive tree (Olea europaea) is a hybrid of three species: Olea africana (Arabia and Egypt ), Olea laperrini (south Morocco ) and Olea ferruginea ( Asia Minor ). Olive trees were probably first exploited at the beginning of the Neolithic era (6,000 BC) in eastern Anatolia, closed off in the west by Persia, in the south by the Syrian-Iraqi frontier and in the north by the foothills of Mount Ararat, very close to the place where Noah's Ark landed after the Flood, according to the Book of Genesis in the Old Testament: "on the seventeenth day of the seventh month the ark came to rest" . " 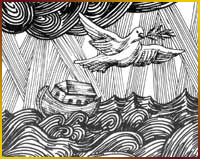 the dove came in to him at eventide: and lo, in her mouth an olive-leaf plucked off". From there it spread to Greece , Italy , and later to all the Mediterranean countries: Tunisia , Algeria , Morocco , and, thanks to the Phoenicians, Spain . Olive tree cultivation in Egypt has been verified as from 2,000 BC, during the 18 th dynasty (1580-1320 BC), especially on the coastal strip that stretches from Alexandria to Fayoum. In the era of the Pharaohs, olive oil was used to light up the temples; it was the first civilization to extract the oil by natural mechanical means, the same ones that form the basis of current systems. In the cuisine of those times it was already used to dress lettuce. It was also usual to bathe in perfumed oil and mummies between 980 and 715 BC were given crowns made of olive tree branches, as were found in Pharaohs' tombs, for example, the so-called "Crown of Justice" on Tutankhamen's head. In the picture, from an Egyptian tomb of 1,500 BC, slaves can be seen obtaining oil by the press method. Greece also exploited the virtues of the olive tree. The Greeks cultivated it and protected it with very severe laws to the extent that if a person cut down more than two olive trees, he was exiled and all his properties were confiscated. According to mythology, Pallas Athena, the goddess of wisdom, competed against Poseidon, god of the sea, for the right to be patron deity of the city founded by Cecrops, the first king of Attica . Their challenge was to create the most useful thing for man. While Poseidon created the horse, a symbol of strength, beauty and a means of transport, Athena struck the earth with her spear and caused an olive tree to sprout: "a strong plant, able to live long and to produce tasty, savoury fruits, from which men could get an excellent liquid, ideal for dressing food, giving the body strength, healing wounds and giving light to lamps." Thus, Pallas Athena was chosen by Zeus to be the patron goddess of the recently created city of Athens in Ancient Greece. In the gymnastic contests in Athens , winners of the Panathenea were given the prize of all the oil from the plantations of Attica consecrated to Minerva, as well as the crown woven with the branches of the holy olive tree that Hercules had planted in Olympia . The olive tree and its fruit: the olive is mentioned many times in the Bible, both in the Old and in the New Testament. The first occasion it is mentioned is when Jehovah gives his orders to Moses in the Book of Exodus and says: " command the children of Israel that they bring unto thee, pure oil olive beaten for lights to pour into the lamps always." The healing properties of olive oil have always been known and seen with a holy and mythical halo. In many ancient cultures it was used to consecrate kings, popes and important priests. In the Jewish faith, its holy use was, and continues to be, precisely regulated, the olive oil having to be of the utmost quality, as a symbol of purity. The Phoenicians are probably responsible for its introduction for cultivation in Spain when they started the colonization of the western Mediterranean at the end of the second millennium BC. At the beginning the influence was small but by the end of the 7 th century BC all the splendour of the Phoenician culture flourished including olive tree cultivation and oil extraction processes. The era of the Roman occupation (at the end of the 3 rd century BC) was the Golden Age of the olive tree in Spain , as its cultivation spread enormously. 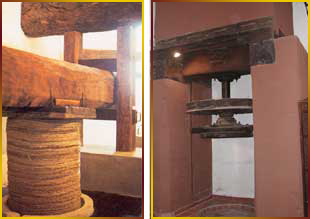 There are several works on agriculture from this period, such as Columela's (1 st century BC) who comments on how to look after olive trees, olive harvesting, oil extraction, and its applications. The oldest cookery book preserved is by Apicius (1 st century AD) which includes numerous recipes with olive oil. 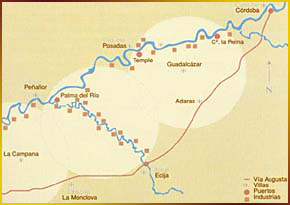 Olive cultivation developed with such force that the entire Guadalquivir basin filled with plantations, Kordyba ( Cordoba ) being the province with the highest density of olive trees in the south of the Iberian peninsula . It was then that the Guadalquivir River began to be used as a waterway to transport all the oil from places with enormous production such as El Cortijo de la Reina, La Estrella, Mingaboes, El Temple,. the current Palma del Río being the nerve centre from where barges travelled down the river loaded with oil amphorae to Seville. 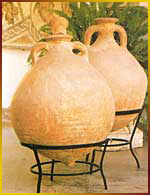 There, these large jars were loaded onto ships to be exported to Mediterranean countries, especially Rome . Pliny the Elder, between 60 and 65 AD, describes the excellence of Andalusia's olive oil; it was one of the raw materials most valued by Rome , due to which a thriving trade and a continuous export of the product were established. We find evidence of this exportation in Mount Testaccio , one of Rome 's hills, which consists of 40 million oil amphorae, the majority from Spain between 138 and 260 AD. Later, the Arabs fostered and spread olive cultivation in Spain , as even the Koran praises it (in 24:35). It was they who most influenced the use of olive oil in our diets. 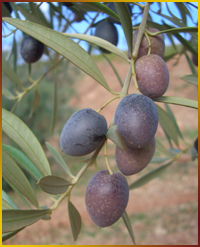 The Castilian words 'aceituna' ( olive ), 'aceite' ( oil ) and 'acebuche' ( wild olive ) come from Arabic. For example, the Spanish 'aceite' comes from Arabic 'al-zait' which means olive juice , and 'acebuche' comes from 'zebbuj' whose root is found in the Berber 'azzemmur'. There are other words of Arabic origin used in today's Spanish in the olive sector, such as 'almazara' (al-ma`sara), which was the term given to the press, and 'alcuza' (al-kuza), a clay jar for oil. This period saw the development of the methods for cultivation, planting, pruning, fertilizing, and, above all, harvesting and the extraction process, as we learn from Abu Zacaria's Book of Agriculture . Olive groves occupied enormous areas above all in the Aljarafe area of Seville , about which the same author comments, ". its olive groves are so dense with so many intertwining branches that the suns rays are hardly able to filter past them". With the expulsion of the Moors and later the Jews, both experts in olive cultivation, the consumption of oil fell greatly between the 15 th and 17 th centuries, giving way to the use of animal fats mainly in the kingdoms of Castile , Navarre , and Leon . However, Aragon , Catalonia and Andalusia continued to prefer olive oil. It then became a food that was consumed by members of the clergy and upper classes, becoming even the object of tithes and other taxes levied by town parishes in Andalusia . Nevertheless, during the 16 th century, due to the growth of the Spanish population and the needs brought about by the discovery and colonization of the New World , olive oil consumption rose. At about that time, oil extraction methods were modernised and the development of lever and tower presses, stone mills and mixers and a complete auxiliary industry took place, thus improving the quality of the oil. 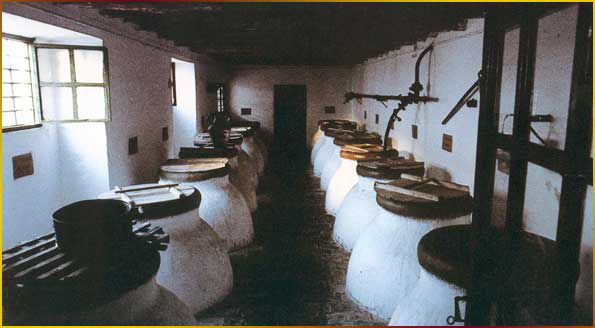 Fully organised cellars were built where oil was kept in large earthenware jars buried in the ground. The oil would remain there till decanting was complete. By the end of the 19 th century, the olive expansion process was complete. The process had started in the 18 th century and now covered in Andalusia a territory of 240,000 hectares (593,000 acres). 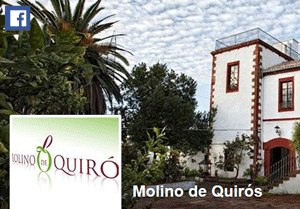 The olive grove of Sierra Morena dates back to this period as expressed by Casas-Deza, who, referring to the municipality of Montoro , writes: ". since the last third of the last century a large section of the land has been taken to plant olive trees." At the end of the 19 th and beginning of the 20 th century, the olive tree and its produce began to thrive once again thanks to the recognition of its nutritional value and of the importance of olive oil to health, to the extent that it became a fundamental element in diets and an efficient protection against degenerative diseases, especially cardiovascular (arteriosclerosis). In Spain , with the introduction of modern cultivation systems (drip irrigation), new plantations and intensive crops, the average production of oil in the last years has gone up from 750,000 tonnes to 1,400,000 tonnes. At the same time, oil quality has been improving more and more due to the fact that there has been a vast improvement in the methods for harvesting (branch and trunk vibrators) and extraction with the continuous extraction technology (decanter-horizontal centrifuges). que están respirando amor? - that they are breathing love?